In spite of extensive research on corporate social responsibility (CSR) and its link with economic and social performance, few studies have investigated the institutional determinants of CSR. This article draws upon neo-institutional theory and comparative institutional analysis to compare the influence of different institutional environments on CSR policies of European firms. On the basis of a dataset of European firms, we find that firms from the more liberal market economies of the Anglo-Saxon countries score higher on most dimensions of CSR than firms in the more coordinated market economies (CMEs) in Continental Europe. This result lends support to the view of voluntary CSR practices in liberal economies as being a substitute for institutionalized forms of stakeholder participation. Meanwhile, CSR tends not to mirror more institutionalized forms of stakeholder coordination. Instead, in CMEs, CSR often takes on more implicit forms. Our analysis also shows that national institutional and sectoral-level factors have an asymmetric effect – strongly influencing the likelihood of firms adopting ‘minimum standards’ of CSR, but having little influence on the adoption of ‘best practices’. We would like to thank Ruth Aguilera, Steve Brammer, Anke Hassel, Sanford Jacoby, Daniel Kinderman, Cynthia Williams and Geoffrey Wood for helpful comments, as well as the participants of the ICCSR Research Workshop in Nottingham, the annual conference of the Society for Socio-Economics in Costa Rica, the second CSR Conference at the Humboldt University Berlin, the Waseda University workshop on ‘Corporate Governance and Labor Relations’, the University of Bath, and the European School of Management and Technology for useful comments and suggestions. The two anonymous reviewers made very important suggestions to improve the final version. We are very grateful for Sustainable Asset Management (SAM) for making this data available to us. All errors remain our own. Dow Jones Indexes and FTSE, Industry Classification Benchmark: 2006, http://www.icbenchmark.com/docs/ICB_StructureSheet_120104.pdf. FTSE The Index Company: 2006, FTSE4Good Index Series: Inclusion Criteria, http://www.ftse.com/Indices/FTSE4Good_Index_Series/Downloads/FTSE4Good_Inclusion_Criteria_Brochure_Feb_06.pdf. Hall, P. and D. W. Gingerich: 2004, Varieties of Capitalism and Institutional complementarities in the macroeconomy, an empirical analysis, MPifG Discussion Paper 04/5 www.mpifg.de. 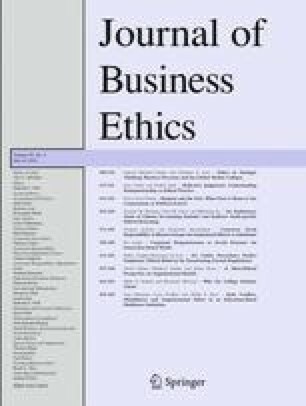 Venanzi, D. and B. Fidanza: 2006, ‘Corporate Social Responsibility and Value Creation: Determinants and Mutual Relationships in a Sample of European Listed Firms’, http://papers.ssrn.com/sol3/papers.cfm?abstract_id=939710.